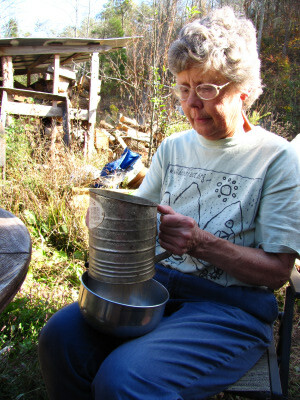 In the garden, one of our biggest experiments in 2010 was embarking on the first stage of experimentation with grain. We tried a do-nothing oats bed, grew amaranth and quinoa in the vegetable garden, and tried out buckwheat and oats in the chicken pasture. We learned a lot, but we still have a long way to go before we achieve grain independence. First, I have to admit that our eating habits changed dramatically in the middle of our grain experiment, which veered my priorities away from grain. After extensive research, I decided that we needed to increase the percentage of protein in our diets. Since I wasn't going to cut back on fruits and vegetables, that meant reducing our carbohydrates to leave more room on our plates for beans and meat. Growing oats suddenly seemed much less important once I stopped eating them for breakfast, and other grains were similarly sidetracked to the chicken feed category. But we both felt that the change was a plus since we started feeling perkier, our brains flowed faster, and we even lost some weight. That said, we learned a lot about growing grains anyway. 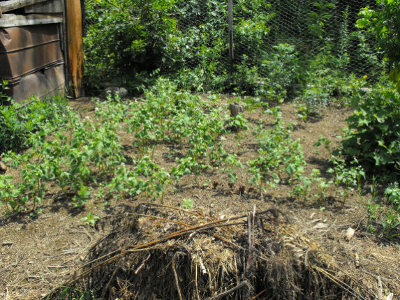 Our do-nothing patch (first photo) wasn't very successful --- leaving the chicken tractor on a patch of ground for a week in the winter is not enough to kill off the weeds, and the oats had a lot of competition and ended up patchy and scrawny. A more effective do-nothing method turned out to be planting grains in a paddock of the chicken pasture that was scratched bare over the early summer and then had the last few hardy weeds hoed out by hand. 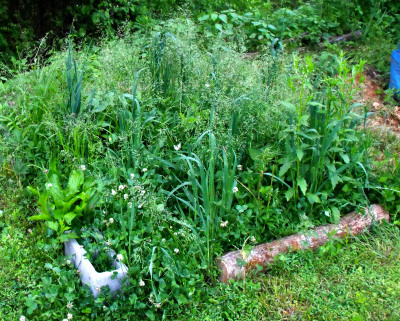 Of course, growing grains in the vegetable garden was easy, but seemed like a waste of space since the plants were hardy enough to put up with the minimal work chicken pasture situation. In terms of variety selection, the results were once again a mixed bag. I was intrigued by hullless oats, but in practice found that they were much more finicky than traditional oats. I can't draw many conclusions from the failure of hullless oats in the do-nothing patch, but I did grow side by side hullless and traditional oats as cover crops starting in August and the former achieved a height of perhaps a third the size of the latter. I suspect that it's better to just grow traditional oats and find a way to hull them if you want to eat them yourselves. In the unusual grain category, quinoa was a flop --- perhaps I need to try another variety? 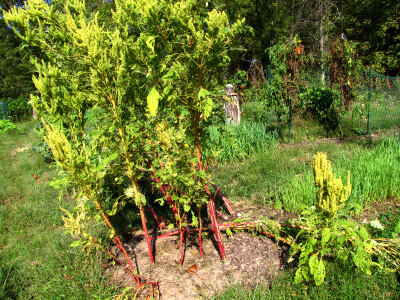 On the other hand, Manna de Montana Amaranth was extremely productive, and grew so tall that I suspect I could grow it in the chicken pasture and let the flock graze between the plants without worrying about them reaching the seeds. Amaranth was also very easy to thresh and winnow, although I'm still learning how to cook it. Back among traditional grains, we're experimenting with growing wheat this winter, but the jury is still out. I have enough data about buckwheat, though, to say that it's a so-so grain that I probably won't repeat (except as a cover crop.) Buckwheat did relatively well in the chicken pasture, but complained about drought --- I think that for maximum yields, I should plant it in a part of the garden that gets irrigated. On the other hand, buckwheat wasn't a fan of the waterlogged soil where I grew it as a cover crop. The plants also didn't seem to produce all that much grain, and it would have been tough to pick the individual seeds if I hadn't just turned the chickens in to eat it up. Looking toward the future, our grain patches next year will look very different. The only grains we eat much of nowadays are a bit of rice and wheat, but since I can't grow the former I'll be planting wheat and amaranth for our table. For the chickens, I want to try out millet and field corn, but will focus more on the high protein sunflower seeds and perhaps some sort of legume. My hope is that I can continue to grow our grains in the two chicken pasture paddocks which are on flat ground, utilizing the chickens to prepare the soil for me and to delete most weeds. Turn your invention into a salary with Microbusiness Independence. This will be the year I get my amaranth planted... I can feel it. As an aside, do you ever notice that posting comments goes really slowly from the time one clicks the "post comment" button to the time it actually returns to the page? Or is it just me? You should go for it --- amaranth was really one of the easiest things I grew all year! While perusing my seedsaver catalog and planning my garden for spring, I noticed this pretty flower that said it was used as a cerial. I caught my eye so I looked closer and it was a different variety of amaranth. It supposed to grow 3-4' which will help hide my partially painted corregated rain gutter/hose. The variety I am looking at has pretty pink fronds. I am concidering back planting with sunflowers and planting sweet mace in the front to repeat the yellow. My goal is to add more color to my edible landscaping, to appease the landlord. It looks like you had a different variety. How tall was yours supposed to get/ It lokked impressive. I am curious how much seed you sowed for your bed? It looked like a fairly small patch, for a grain.I feel that even if all I get back is a tiny cupful it will gave been a success. Have you tried popping the seeds. That sounds like a tasty and easy way to use it. I'm not sure if the variety you're looking at would be the best bet. Amaranth comes in many different varieties (and even species.) Some have been bred as ornamentals (which is what yours sounds like with its pretty pink fronds), others to be eaten as greens, and yet others to be used as cereals. My research suggests that you should look for a variety that is listed as a cereal and has pale (instead of dark) seeds for best flavor.